The Salem Police Department will be participating in the DEA National Prescription Drug Take Back Day. We encourage citizens to bring their unwanted and unused medications to the City Office. The Drug Take Back Day is on Saturday, April 27, 2019, from 10 a.m. to 2 p.m. This event will be located on the South side of the City Building near the ambulance bay at 30 West 100 South. Salem City Pressurized Irrigation System. The city is anticipating turning the water on for the PI system either at the end of April or the first part of May. We have really appreciated the rain and moisture we are getting to help give our lawns the water they are needing. The weather will also be a factor in when the system is turned on. When a date is determined, the city will notify by Email, Text, Facebook, and on the Web Page. If we do not have a current phone number or email, please let us know (salemcity@salemcity.org). Also, please make sure your valves are turned off, to help prevent any flooding when the system is turned on. The RV dump station will be closed until further notice due to construction. We will open the Green Waste in April. Located at 715 West Arrowhead Trail. April 8th to the 29nd. 12:00pm to 6:00pm on Saturdays. Tree branches - 4 inches in width and smaller. Grass clippings, please put them in designated area. Garden waste is approved.Trimmed branches and shrub clippings. Leaves are welcome. All vehicles will need to have proof of residency with them, ID with address or a current city bill. Local residents only. No professional landscape companies or tree cutting companies. The Utah County Health Department has recently opened new offices that are now open full-time in Payson. Besides the WIC program clinic, which has been in Payson for many years, we now have an immunization clinic offering school and travel vaccines and a Vital Records office for birth and death certificates open daily in the new Wasatch Mental Health Building. To celebrate the opening of these offices and to build public awareness of these services in the south end of the county, a Resource Day will be held. It will be on Saturday, May 4th, from 9 a.m. to 12 p.m. 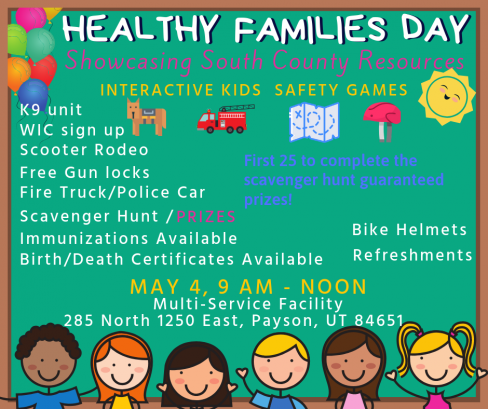 There will be many of the non-profit organizations which provide community services in Utah County that will provide booths and games for families in our community to visit. This will be in conjunction with the "Safe Kids" day, so there will also be booths about bike safety and car seats. The address is 285 North 1250 East in Payson. Preparations will begin in March. The pageant will be held May 25th. CALENDARS: The 2019 Salem City Calendars have been mailed out. If you are a resident and get your mail in a Post Office box, you will need to come to the office to pick up your calendar. We do have extra calendars for sale at $10 each. There are some 2018 calendars left if you would like one for the pictures or the emergency cards. You can stop by and pick one up. They are free as long as they last. Salem City has a NEW Exchange Zone. at 90 South Main Street. Salem City has ordinances in place regarding nuisance abatement on property. Nuisances include but are not limited to the following. Inoperable vehicle's, noxious or unsightly weeds, debris including trash, lumber, construction waste, bricks, tires or other items similar in nature. If you have any questions please feel free to to contact Officer Christensen of the Salem Police Department 801-423-2312.
any types of sharps including needles. South Valley Solid Waste District will take your sharps including needles. You can drop medical needles off to them if they are in a sharp container or in a 2 liter soda bottle.You can purchase sharp containers at, Salem Hills Pharmacy, Walmart or by going online. Here is a guide Common Elderly Scams for our Senior Community. It includes the common fraud tactics and popular scams used on seniors. We hope you find this guide helpful. For information on what is happening in Salem, click on Recent News!